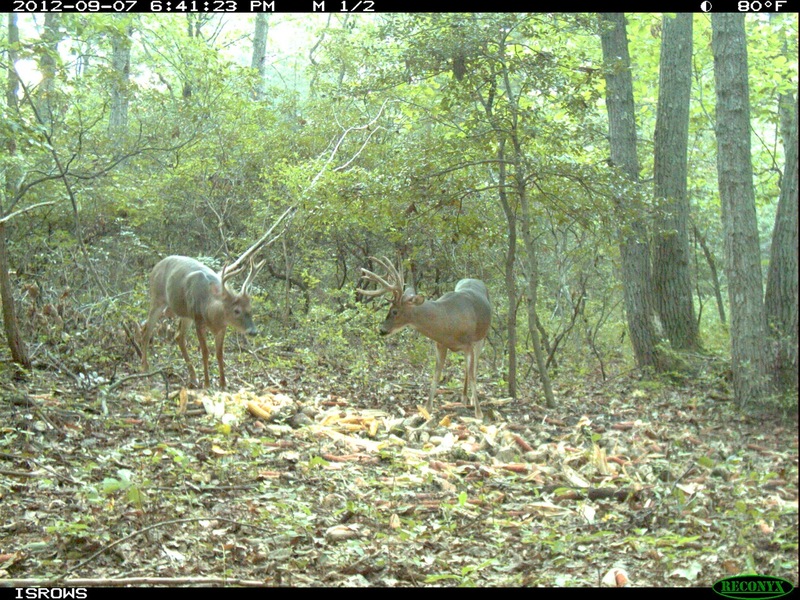 Extended Bow kicked off in 2012 with substantial rut activity. The day before, the last day of regular bow season, I had an encounter with 2 shooter bucks chasing a hot doe all around me in the woods for over an hour. I was able to get a pretty good look at both deer but neither provided me with a shot. The very next morning, October 27 2012, first day of extended bow season just at sun up, I hit the grunt tube with two short grunts and a ten pointer come right into me and provide me with a shot at 27 yds. After wiating an hour I texted my cousin and we got underway with the recovery. He went 80 yds. Here is a pic of where i found him. This buck dressed out at 140 lbs. I killed My buck on a Saturday. Friday of that same week, I got a text of a big 10 pointer that had been killed at 3:30 in the afternoon so I made arrangements to do a photo shoot. From the text I could tell that Drew had killed a substantial buck, but I was blown away upon seeing the deer in person. 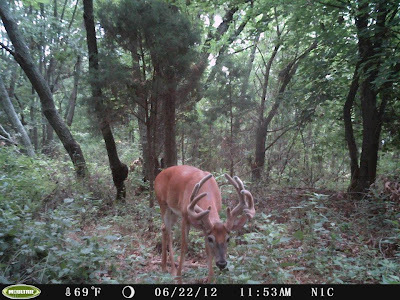 Drew had this buck on his trail camera during Hurricane Sandy and quite a few people had seen this Slammer in his area. After checking an astro table that said peak deer movement would start at 2:19 he made sure he was in the stand by 2:00. He killed this buck with his compound bow at 3:30 pm. This deer had an official net non typical score of 159 2/8 "
Next to record a kill was my dad. He shot this seven pointer quartering away hard with a 125 grain vortex broad head at 40 yards using Stryker 380 crossbow. The bolt entered just behind the shoulder and exited through the front of the chest. The buck went a mere 20 yds. when we field dressed this deer it was completely devoid of blood. This deer also weighed in at 140 lbs. 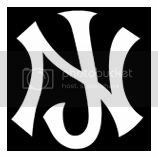 The following morning November tenth, I received a call form a friend whose nephew had killed a nice ten pointer with the bow. I asked them to bring it by. Jason's deer dressed in at 145 lbs and had a 20" spread. The Evening of November 13th my phone rang and Muddy called to say he was bring one by. He killed this eight pointer with a broken g-2 and a kicker with his 10 point crossbow. Muddy's buck dressed 140 lbs. which seemed to be the average weight of the bucks killed in the 2012 season. Next was GV who downed this wide racked nine pointer on the morning of November 23rd with his compound bow. This deer had a very unique right antler. 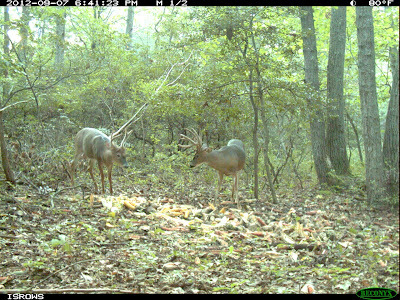 Gary's buck dressed in at 120 lbs. The same morning that GV killed his 9 point buck, Dave was able to connect with a wide 7. Dave's deer dressed 125 lbs. 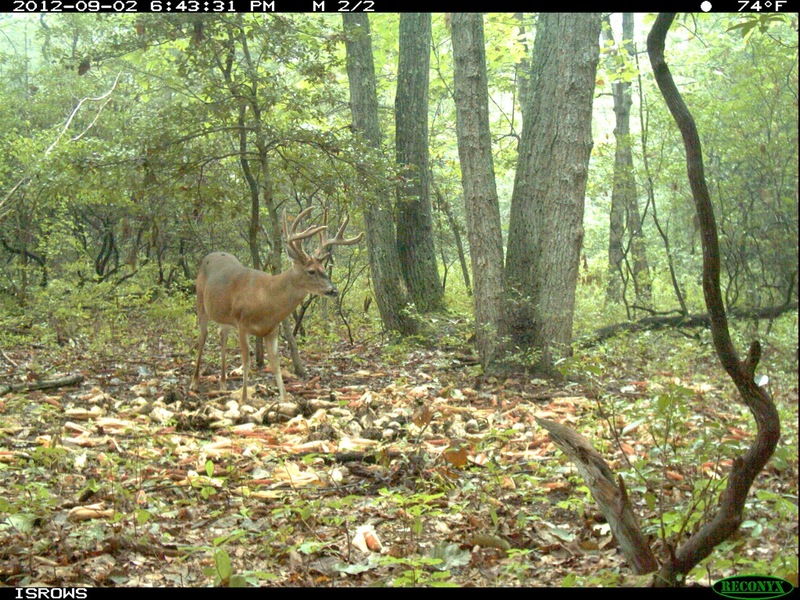 New Jersey's Early bow season started off strong this year. The first Sunday of the season my Dad received a phone call requesting green scoring of two bucks that were shot by twin brothers. The brother that contacted him, Matt, said that he had killed a fourteen pointer and his Twin brother Nick killed an Eleven the same evening. Needless to say we were excited to get a close up look at these two bucks. After killing his EAB doe on Saturday morning and getting rained out that evening Matt found himself in his most productive stand location Sunday afternoon hunting over a food plot that he closely manages throughout the summer. His target buck arrived on the scene and Matt executed a text book shot with his Mathews bow equipped with Rage Titanium broad heads. 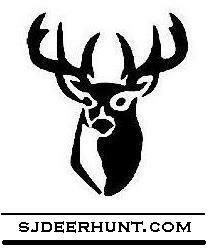 After the impact, Matt watched his buck go down right in the bean field going only 40 yards. Matt had his deer on the ground by 6:00 on the second day. 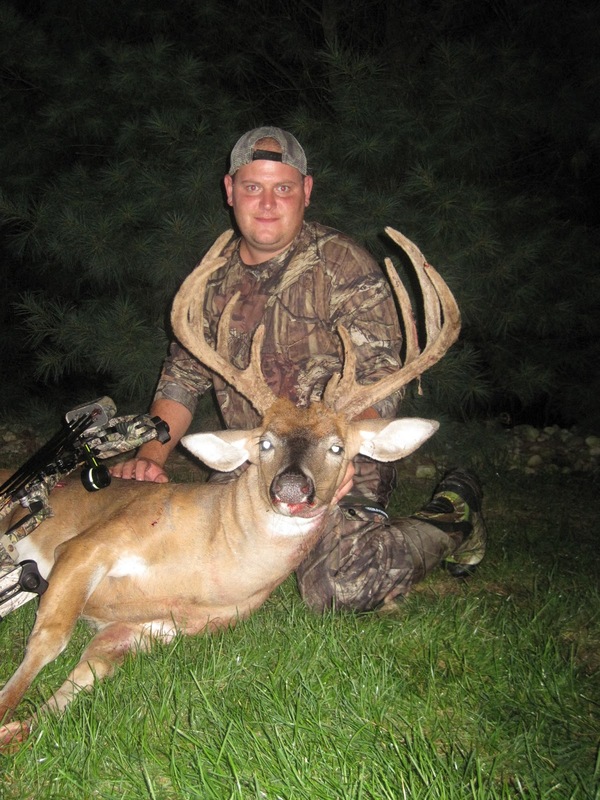 The same evening over 30 miles away Matt's twin brother Nick arrowed this slammer 11 pointer with his compound bow. 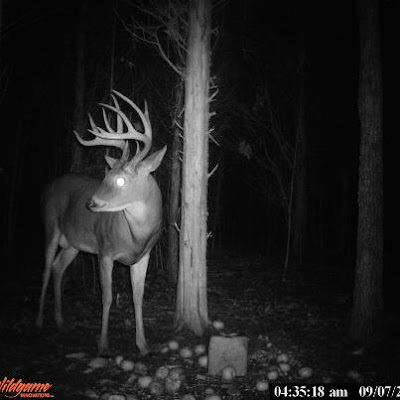 Nick had this deer repeatedly on his trail camera as this deer too was his target buck. Nick saw his buck coming his way through the dense thicket where he has his stand located. He told me his stand is in a maple that affords him a lot of cover but the downside is he doesn't have wide field of view. Before he even knew it his buck was right on top of his position and had a split second to shoot this deer as its vital area passed into a small window in the thick brush. Nick executed his shot perfectly and he watched his buck run and slam head on right into a cherry tree and then he heard him breath his last breath. Nicks buck weighed in at an amazing 213 pounds dressed on a certified scale. carbon arrows tipped with Grim Reaper broad heads. Here is a Picture of Nicks buck on trail camera he told me to take note that the date was off by a month. Here is another picture of Nicks buck 2 days before the kill. On the very same Sunday Anthony filled his buck tag killing this velvet 11 pointer that he had been watching on his trail camera for a month prior. After killing his EAB doe on Saturday morning and then getting washed out during the evening hunt, he continued his pursuit Sunday evening. Anthony told me on the way into his stand that afternoon he spooked a doe and a small buck before reaching the spot. He saw a couple of deer through out the course of the evening and then he spotted a six pointer that he recognized as the big buck traveling companion. Little did he know, the buck was only 40 yards from him and proceeded to emerge from the laurels. The deer got within 25 yards and sensed that something was up. Just as he turned around to leave Anthony let loose. Anthony got his work done with a Hoyt Alpha Burner Compound shooting Beaman MFX arrows tipped with 100 grain Spitfire Maxx broad heads. This buck was shot at 27 yards quartering away and only traveled 30 yards before hitting the ground. 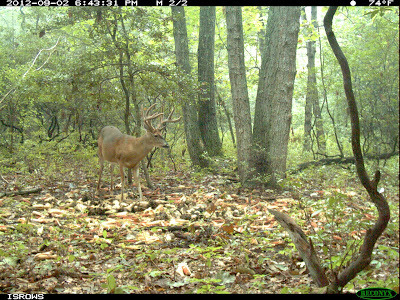 Anthony's buck on trail camera.